A Preschool Carpet that provides comfort and knowledge! 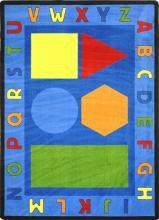 We have designed the most durable classroom rugs and carpets on the market by using SoftFlex® technology. This technology uses tightly woven fibers to prevent wrinkles on the Preschool Carpet and it also provides superior protection from extreme heat and cold. Teachers especially enjoy the safety the carpet provides with its antimicrobial treatment and indoor air quality certification. The Preschool Carpet does much more than allow your students to comfortably sit during story time. We designed the carpet with brilliant colors that highlight the alphabet and popular shapes. Teachers have found that this type of teaching tool, in a more relaxed environment, takes the pressure off a kids who do not perform well under the spotlight of question and answer chalkboard sessions. The Preschool carpet helps young children to gain confidence and it develops communication skills, since the group format fosters interaction.